Please kindly check the YEAR/MAKE/MODEL of your vehicle based on our product description or follow the instruction of Amazon fitment to make sure this item is compatible. DOICOO ALWAYS PROVIDES HIGH QUALITY ENGINE COOLANT TEMPERATURE SENSOR AND SERVICES.It is a serious brand of advanced vehicle auto parts for replacement in the automotive aftermarket and original equipment manufacturing. Its owner has a history of nearly 20 years and millions of dollars' annual sales volume, so DOICOO is the preferred choice of professional technicians and do-it-yourselfers around the globe. As for its engine coolant temperature sensor, it is a brand NEW one, and durably engineered for years of effective performance. 1. If I have any problems with your products or your products don't function well, how can I deal with it? Our engine coolant temperature sensor is of high guaranteed quality. If you receive the items have quality problems or damaged, please email us immediately, and we will provide you with some professional suggestions. And if the products are within the warranty time, you can return or change it for better performance. 2. When can I receive my product? Our engine coolant temperature sensor is shipped by Amazon, and they will deliver our fuel pump to you at the fastest speed. Please kindly check the YEAR/MAKE/MODEL of your vehicle based on our product description or follow the instruction of Amazon fitment to make sure this item is compatible. 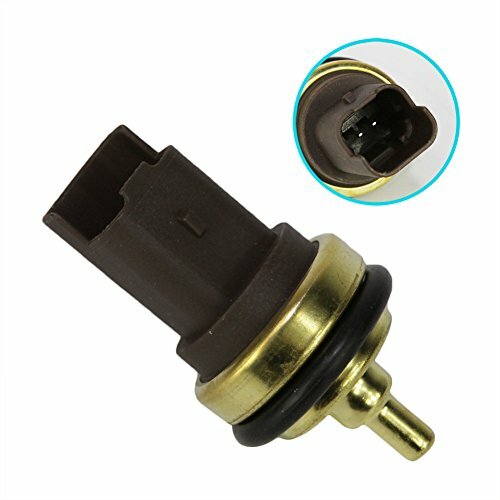 TS16949 & ISO Certified Manufacturer of engine coolant temperature sensor, ONE YEAR unlimited mileage warranty with core high quality Japanese technology which ensures durability and optimum operation. Our engine coolant temperature sensors provide coolant temperature data to the engine management system. When not replaced, vehicle may experience inaccurate temperature gauge function, overheating engine, internal engine damage and/or excessive fuel consumption. This engine coolant temperature sensor is especially designed for BMW 325 318i 325e 325es 325i 325is 325ix 528e M3 Mini Cooper 1986 1987 1988 1989 1990 1991 1992 1993 2007 2008 2009 2010 etc. Compatible OEM part number of this engine coolant temperature sensor is 813 62 1 433 077 , 13621433077,13627535068. DOICOO ALWAYS PROVIDES HIGH QUALITY AUTO PARTS AND SERVICES. If our engine coolant temperature sensor well meets your requirements, we greatly appreciate your POSITIVE feedback and good rating. It's very important to us, Thanks a lot! If you have any questions about this product by DOICOO, contact us by completing and submitting the form below. If you are looking for a specif part number, please include it with your message.